Sony’s Alpha 300 digital SLR (DSLR) camera has finally gone on sale in the UK, approximately three months after details of the device first emerged online. The electronics giant has signed an exclusive deal with UK high-street camera chain Jessops, which put the camera on sale today for a body-only price of £400 (€500/$800). The camera can also be bought with an 18–70mm lens for £500 (€600/$000), or with the same lens plus an 55-200mm lens for £650 (€815/$1200). 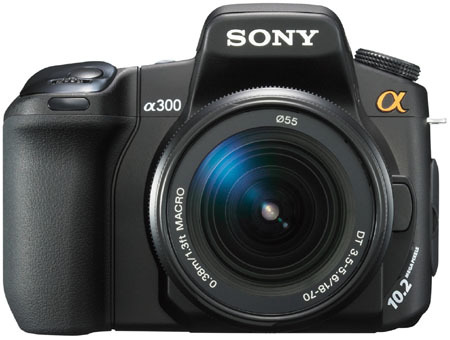 The Alpha 300 sports a 10.2-megapixel CMOS senor and can shoot three continuous frames per second when using the viewfinder, but the camera only manages two frames per second when using the 2.7in LCD. ISO sensitivity tops out at 3200 and the camera features all the usual photography flavours-of-the-month, including Super SteadyShot image stabilisation and an anti-dust mechanism. It also has a slot for CompactFlash Type I/II media cards - an adaptor for Memory Stick Duo cards is also available.